Provides a comfortable platform behind a counter or at a desk (especially a sit/stand desk) to stimulate the deep receptors and fascial of you feet. 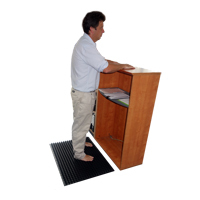 Provides overload stimulation of the kinetic chain associated with walking (gait). Simple exercises while you work.